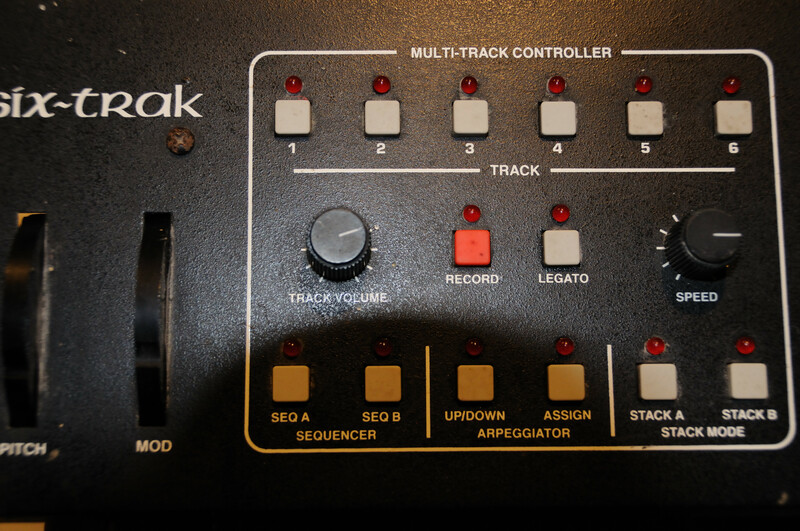 Six-Trak, Analog Synth from Sequential Circuits. Kung Lao's review (This content has been automatically translated from French)" The right plan"
recess I just put my two cents on this point that repels ordinary mortals. "Oulala there's no pots, too boring to program." NO. 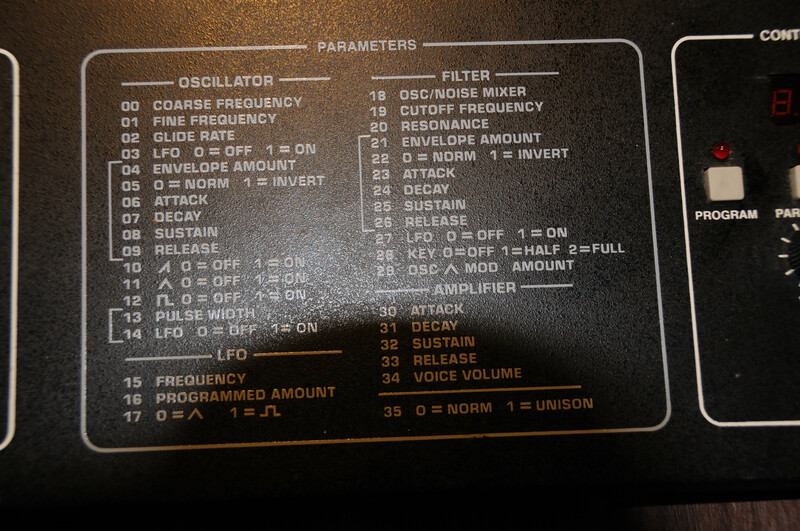 This is one of the first synths to push the implementation noon, so any controller noon to 30 balls transform this austere panel in paradise tweaking. Compared for example to a Juno 106 which leaves at this time around 1000 bullets because he has some faders on the front, I laugh quietly ...! 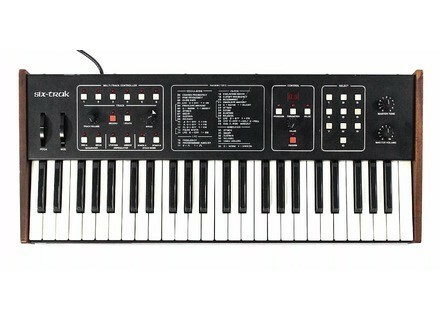 49 keys, lacquered wood cts ... At first glance, the syxtrak looks like a toy ugly. 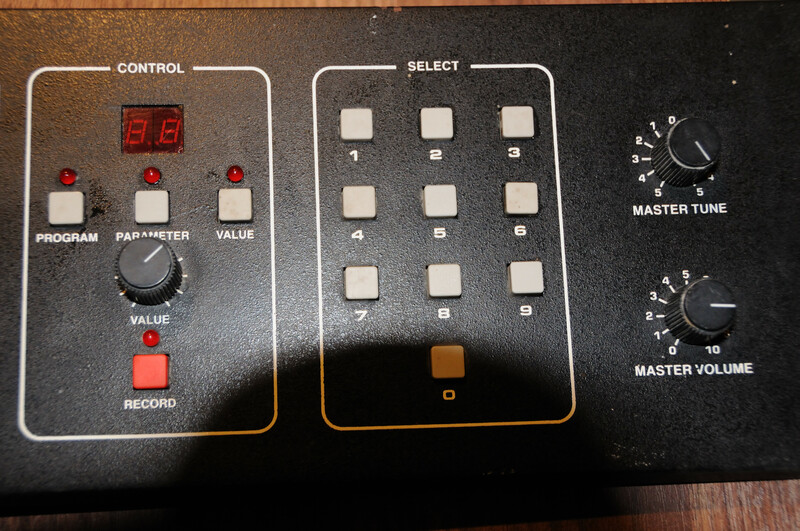 Then you look a little better, and aperoit the (small) sequence, (lightweight) arpgiateur, the programming buttons, then costs a little better, and we feel very heavy analogue of the large , we understand that is the bte MIDI ... and you attached to it. In a polyphony of six notes, this thing is very well for bass heavy pads redundant stuff trs punchy, sounds apriodiques, caressing the R2D2. Mode stack is extraordinary given that each is composed of the three waveforms much fat, add 6 sounds of a button and Listen to your exact: it is bold, bold ... and awfully good! I was wrong to my systrak Spar, and I regret amrement trs. This keyboard has a sound that now lack all these modern things "virtual analog", and other ultra-mega-giga-dspvirtualiss. 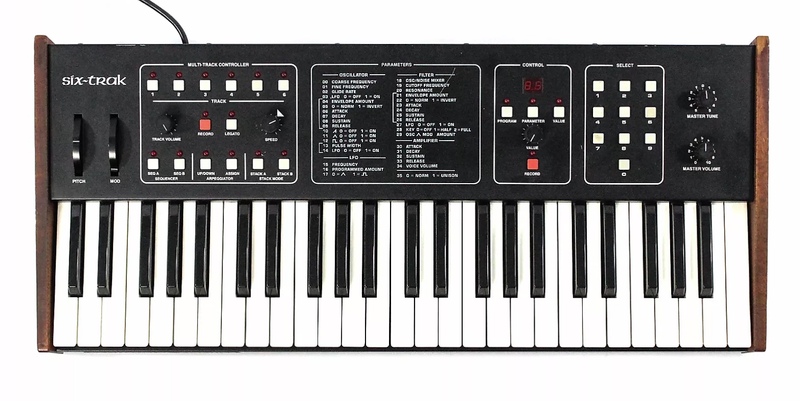 One of the first synths noon and happiness is that it is Fully implementations in Control Change, polyphonic and voice multitimbral 6 6 parts, but no effect is not bad all for the era right? Dave Smith, crateur of Sequential Circuits released the Evolver rcemment enough, it does not even rpond CC ...... will understand. See data sheet for the SPS. I am obliged to 7 for CC and multitimbral but otherwise a compartment or other Andromeda Obviously it does not compare to 2 minutes when I can synthse and put 3 or 4 . This synthesis could not be easier if you edit a few bases in synthse subtractive, and then if there is no "let's hack ... it makes for a synthquot;. There are some key combinations even know when, for example the ignition it does not reoit CC by default. The manual is well done with one or two tutorials for beginners but incomplete on program changes and CC. A Premire you say to a single knob, pav numrique, blah not good for the publishing and has done well in going fast enough, there is no 200 paramtres to edit make a sound (there are 35 + just a 36th that is not shown on the channel rgler srigraphie for MIDI), I myself silent accustomed. I ended up sticking him a MIDI and Controller's foot. I love the sound is simple, the FX science fiction kitsch, low for the d'n'b, dub ... the poles are hardtek, a big kick or a lead tekno ultra classic ... j love it all. And unison .... Aie Aie Aie, admnage. The filter (self-oscillating) really I find a particular sound is "grainy" when you go up the resolution and cost. I post a demo in its tricks and a mode stack. 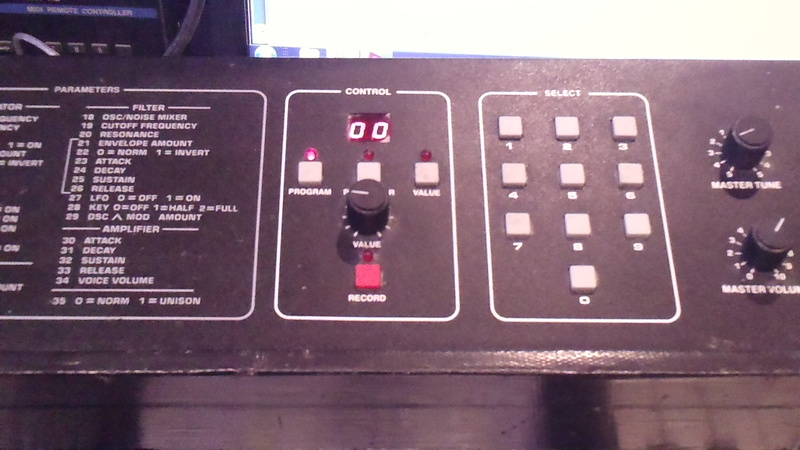 To touch the keyboard I can not tell, no aftertouch or VLOC, damage adpanne but still when you have no keyboard matre. I've had little prs 8 months, the CC is happiness, the sound is beautiful to me APRS, plutt pais ... or end it as the synthse is not growing so it is well suited to beginners, personally I need a synth that goes further by synthse now but I will keep it because it has the great sound and then a synth analog (CONTRL numriquement course) the price is polyphonic multimbral Bonnard and not grow on trees. The plus is the squenceur 600 notes, it's little, but frankly a live tekno enough. At first it's tough, he is 21 this casually synthle mine runs like a charm and I used almost every day, I did that for about eight months and see the RAS time ... so far. Know that there is a change for 6 outputs spares and although the brand is no longer there is still support thanks to former employees of Sequential, they sell kits interviews, spices and dtach rparent. I find it quite ugly but what do we tape it. I Rasht tomorrow without worries.